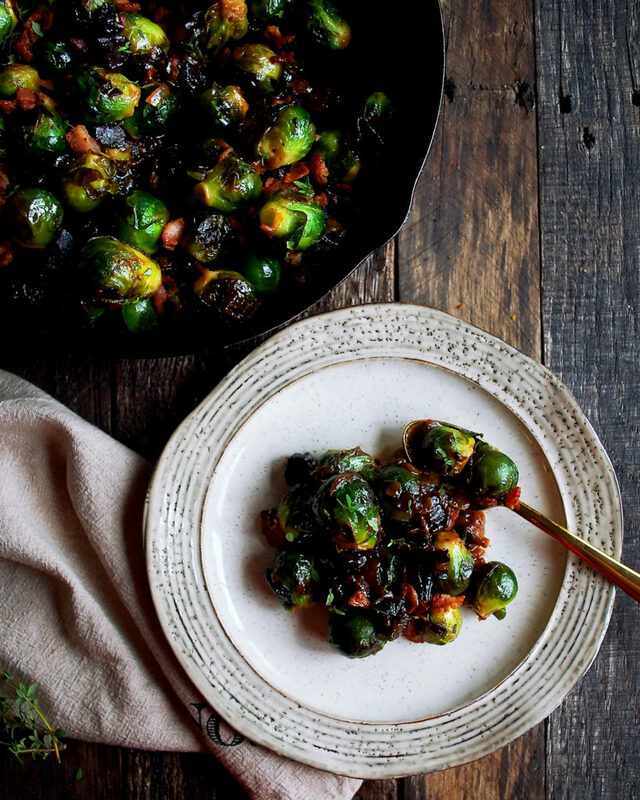 We are in full Thanksgiving mode over here, and I’m so excited to share the side dish you need to have on your holiday table: caramelized brussels sprouts! I remember back when nobody was really making brussels sprouts. Their grassy, somewhat “bitter” taste threw a lot of people off. Nowadays, it’s pretty hard to find a restaurant that doesn’t serve up their version of the little cabbages. 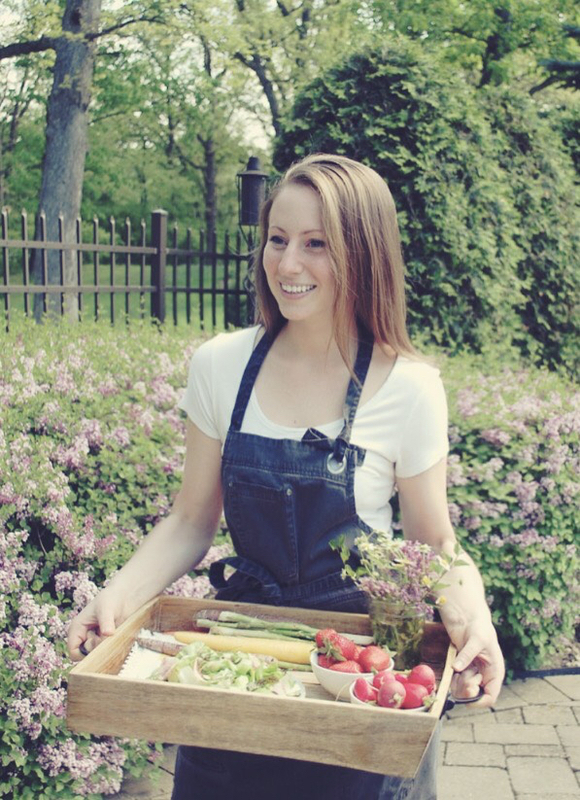 The trick is to simply know how to cook them properly and what flavors work with them. Your first step should always be to blanch the brussels sprouts. This is basically when they get submerged in boiling water just for a few minutes, not until they’re fully cooked, but just enough to take away some of the bitterness. Blanching also softens them and preserves their beautiful bright green color. After blanching, it’s all about layering flavors. I went pretty traditional here with onions, bacon, honey, and mustard…because honestly it just works. 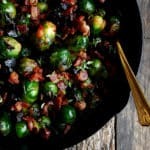 You definitely want the bacon to add a nice “fatty” bite, the honey for sweetness (you definitely need lots of sweetness…I also added prunes), and the mustard for a tangy kick. 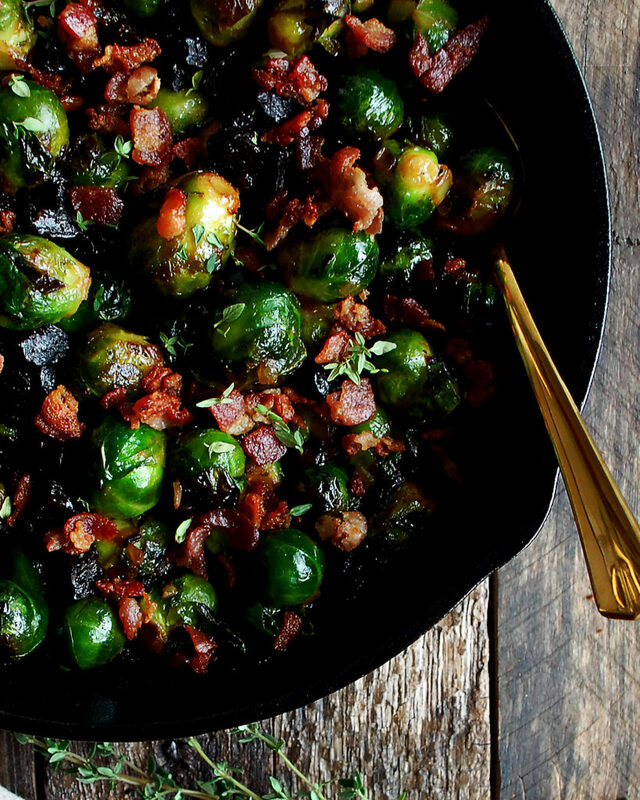 All of these flavors round out the brussels sprouts so they can be as delicious as possible. I add a little butter and lemon juice at the end to finish off these caramelized brussels sprouts on the best possible note. The pictures don’t quite do it justice, but there’s this really syrupy, sticky sauce that is created and is just addicting. 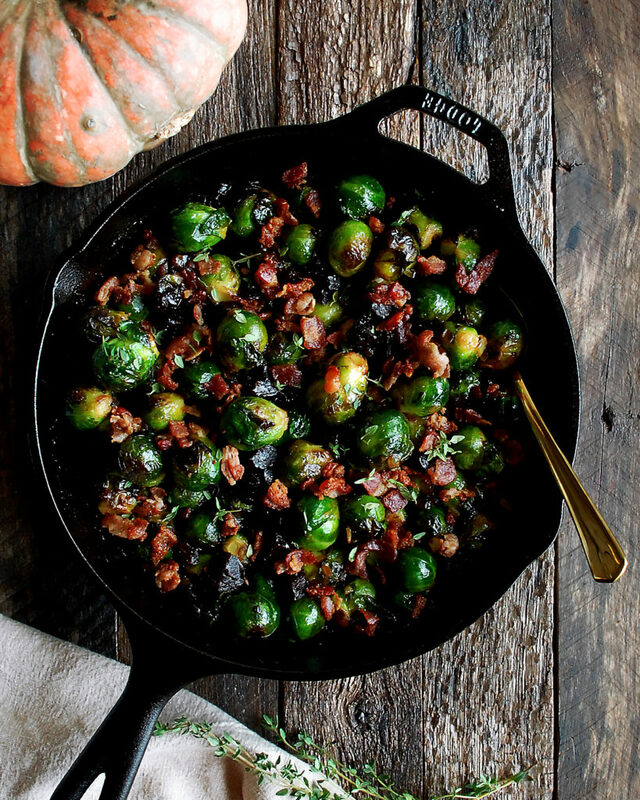 The other key element when working with brussels sprouts is to get them extremely caramelized. I’m talking almost on the verge of being charred. So, what I like to do is render the bacon, cook the onions, and then clear the skillet to caramelize the brussels. Mine were pretty small so I left them whole, but if you have larger brussels sprouts then definitely slice them in half. You want as much surface area to be caramelizing in the hot skillet as possible. I used a 12” Lodge cast-iron skillet, so in order to get the brussels to caramelize well, I cooked the brussels in two batches. Main takeaway: you don’t want to overcrowd the pan or else they won’t get the color and texture you’re looking for…which is golden brown, tender, and really crisp on the edges. Alright, that is all I’ve got on these caramelized brussels sprouts! I hope you love them. Stay tuned for lots more Thanksgiving ideas that will keep your menu exciting and completely delicious, like this roasted pumpkin bacon soup with popcorn granola! Trim the ends off each brussels sprout, only taking off a sliver and still leaving some of the root intact so the brussels sprouts stay together. Remove any dark, thicker leaves. In a pot of boiling, salted water, blanch the brussels sprouts for 4 minutes. Drain the brussels sprouts and transfer them to an ice bath (a big bowl of ice water). Let them cool in the ice bath for 1 minute. Transfer them to a sheet pan lined with paper towels to fully dry. In a cast-iron skillet (I used my 12” Lodge skillet), add the bacon over medium heat. Let the bacon render until crispy, stirring occasionally. Use a slotted spoon to transfer the bacon to a plate lined with paper towels. In the same skillet over medium heat, add the onions to the bacon fat. Let them sauté for a few minutes until caramelized. Remove the onions from the pan and reserve. Raise the heat to medium-high and add enough oil to the skillet (most of the bacon fat should be absorbed) to coat the bottom. When the oil is sizzling hot, add half of the brussels sprouts. Let caramelize and char slightly in the pan on all sides, about 6 minutes or as long as they need. 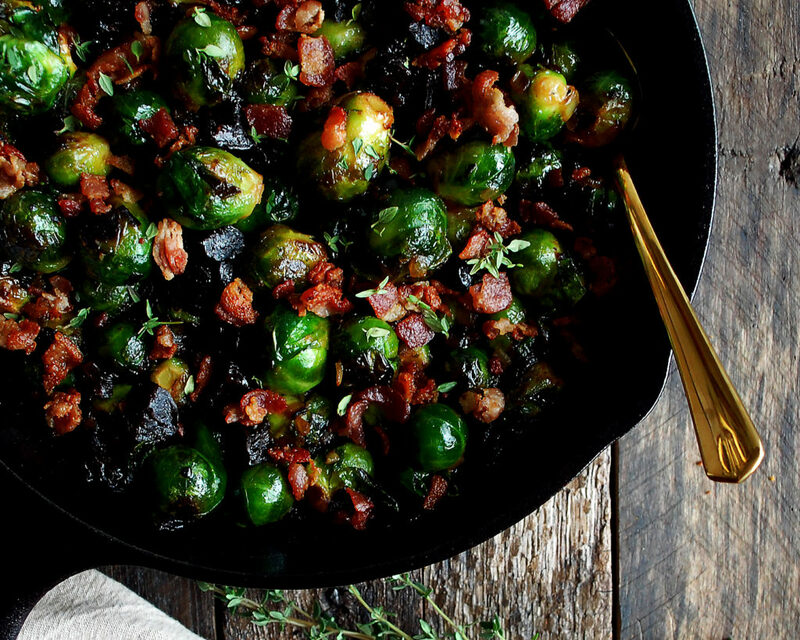 Remove the brussels sprouts and repeat with the remaining ones. Once the remaining brussels sprouts are caramelized, add the first batch of brussels back into the skillet. Add the onions, prunes, Dijon mustard, and honey. Let cook and reduce for about 3 minutes. Lower the heat to low. Add the lemon juice and butter. Let the butter melt. Stir in the bacon at the end. Season with salt to taste.